PABLO MARCOS and THE SPIDER! It's official! 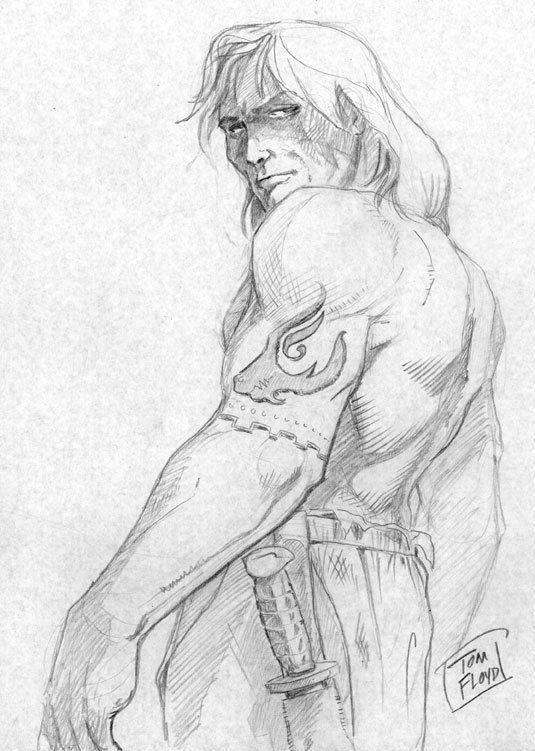 The legendary Pablo Marcos is THE SPIDER's new illustrator! I can hardly contain myself! Pablo has been one of my favorite artists since I was about twelve years old. His masterfully moody pages from Marvel's Tales of the Zombie horror magazine held me spellbound. 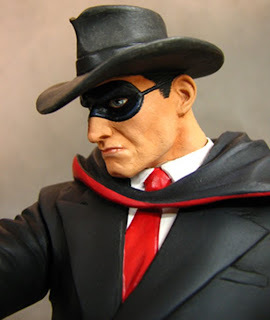 It quickly became my favorite series, as I was sort of growing up out of the mundane super-hero comics of that era. 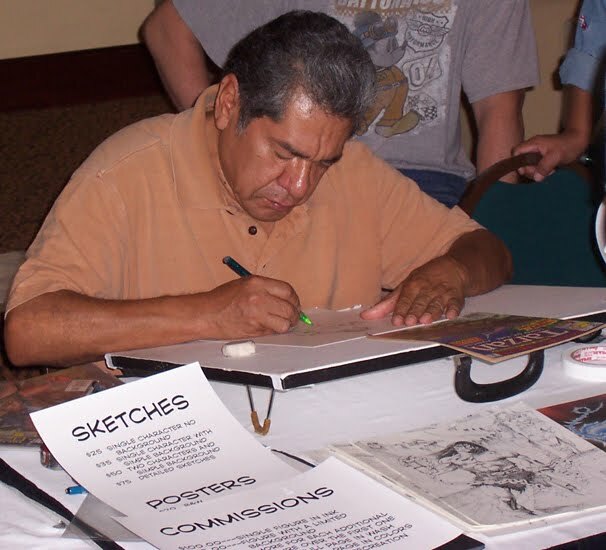 Imagine my excitement two decades later when I actually got to meet Pablo, briefly during his visit to the Tekno Comix offices, and shake his hand. That was a great day for me. Facebook was instrumental in bringing us together again, this time as artistic partners. I rather shyly pitched the notion of THE SPIDER to Pablo and he completely astonished me by enthusiastically agreeing to be the new illustrator. I can hardly express how much this means to me. 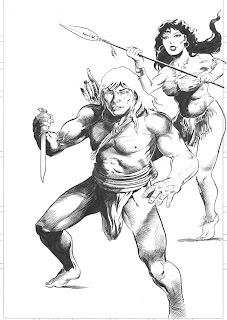 Having artists Tom Floyd on Ki-Gor the Jungle Lord, Ver Curtiss for Black Angel, and now my long-time hero Pablo Marcos drawing THE SPIDER, I'm a very happy writer. Still more thrilling news for THE SPIDER is coming...! I had to post these. Artist Tom Floyd and I are having a ball producing this KI-GOR THE JUNGLE LORD story, which I've titled "War of the Beast-Men." 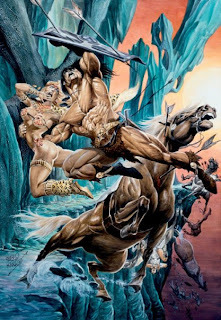 This will be the first Ki-Gor adventure Moonstone will publish and, as such, it will also serve as an introduction of the Jungle Lord's world to our readers. These early sketches by Tom clearly indicate that this isn't the same Africa you learned about in geography class. We decided to portray our own original version of the great jungle, while also remaining true to the spirit of the classic pulp magazine stories of the 1930s and '40s. 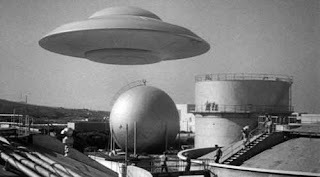 While writing the story, I approached our wild Old World setting as if from the imagination of a ten year old kid in the 1930s. 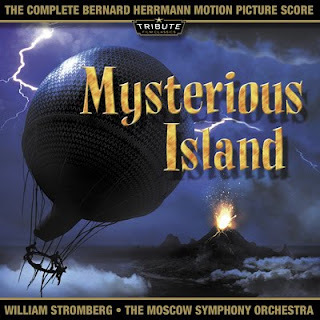 Back then unknown islands and lost continents beckoned explorers toward great adventures in the most exotic and dangerous places on Earth. 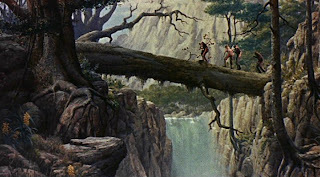 Ki-Gor's Dark Continent is largely unexplored (actually that's still true of the heart of Africa today), a savagely mysterious world of epic sweeping landscapes, and perilously claustrophobic twilight green jungles. Tom and I are feeling quite at home here. Hope you'll join us. 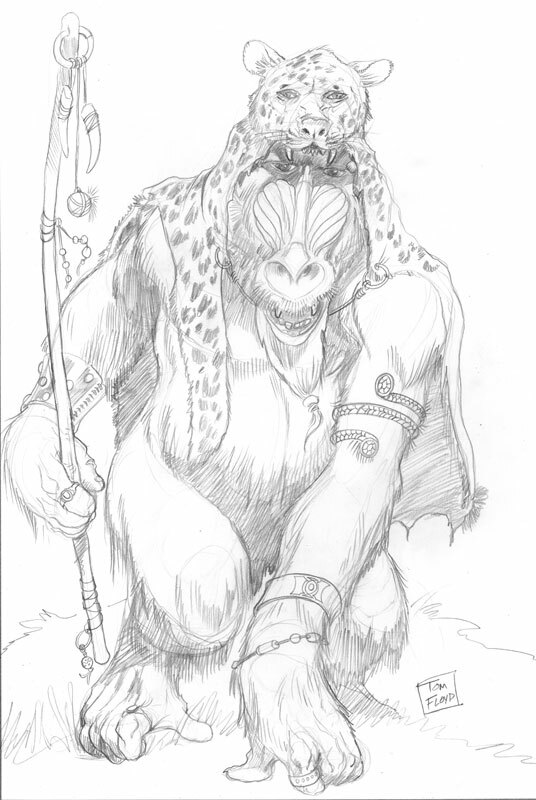 I'll be posting more Ki-Gor material as things continue to develop. Fantastic Adventures by Walter Popp. Couldn't resist posting this teasing shot of Helene, from my upcoming KI-GOR THE JUNGLE LORD pulp story, "War of the Beast-Men". This is not to be confused with the comic book, that's coming a bit later and is also in progress. This early pencil layout is by artist, and best pal, Tom Floyd. Michael Leal recently interviewed me, at some considerable length, for the current issue of Nexus Magazine. I must admit that I enjoyed this interview very much because Michael specifically geared his thoughtful questions directly at my own twenty-three year writing career, instead of the usual generic queries for this sort of thing. I appreciated that nod of respect. There's quite a bit from Memory Lane here, even some stuff I've never spoken about publicly before. 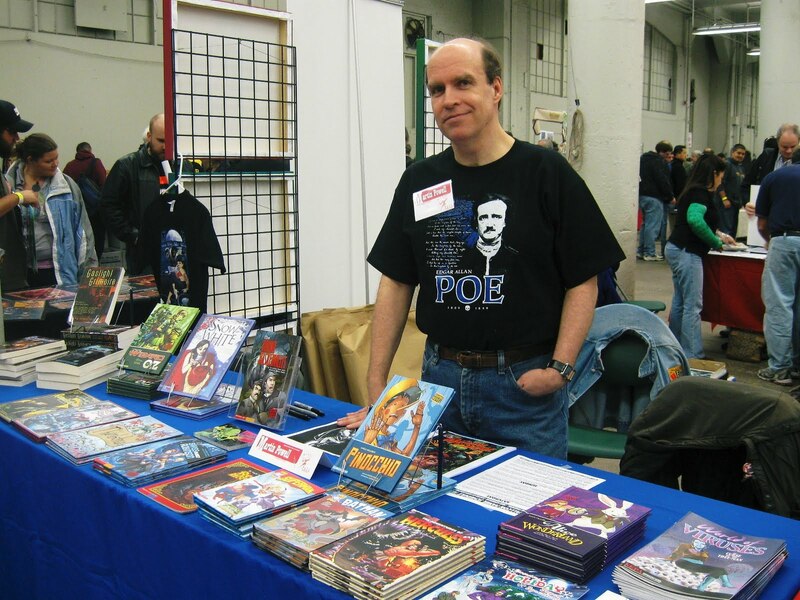 I talk about getting my early breaks in the industry, my brief time as an editor at Tekno Comix, my comics and pulps stories, my new children's books, and, of course, my twenty-plus year relationship with Sherlock Holmes. There's also lots of info on my many new upcoming projects. 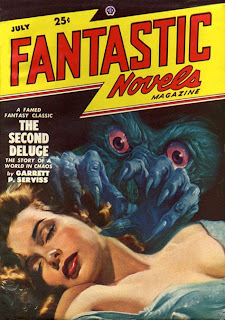 Fantastic Novels Magazine by Sterne Stevens. 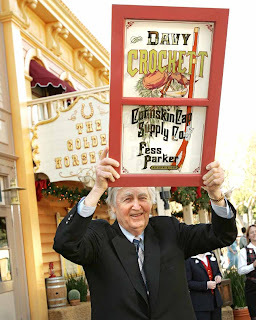 When Davy Crockett, King of the Wild Frontier played on Sunday evening's Wonderful World of Disney, every kid in my neighborhood was glued to the tube. Me too. 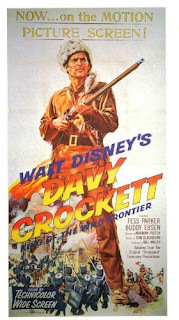 I'd missed out on the original craze of Davy Crockett coonskin caps, but my older brothers had enthusiastically prepared me for the frontier wonderment that lay ahead. 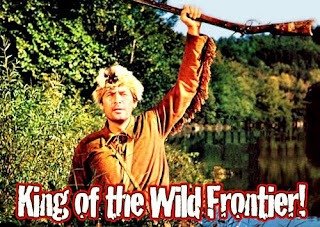 Thanks to them, I had inherited a stack of comic books, an awesome Davy Crockett lunchbox, and learned that our next door neighbor had appeared as an Indian extra in Davy Crockett and the River Pirates, which had been filmed on the Ohio River outside of my hometown of Louisville, Ky. Didn't get any cooler than that. I can't begin to express how much I loved this series. One of my proudest moments was posing for a photograph next to a monument in Davy Crockett State Park when I was nine years old, while on a family vacation in Tennessee. 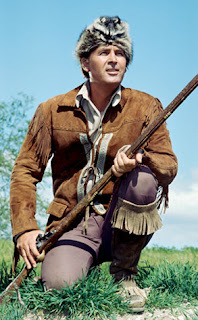 Today actor Fess Parker, world famous for his roles of Davy Crockett and Daniel Boone, has passed away at the age of 85. I wish I could have met him, just to say how special those shows were to me. They still are. Rest in peace, Fess. Say hello to Davy and Daniel. I'm certain they are very grateful to you, too. 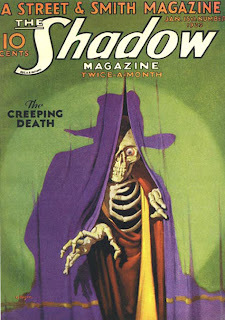 The Shadow by George Rozen. 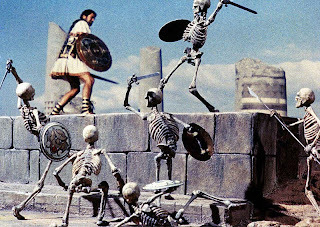 How wondrously ironic that during the Ray Harryhausen Film Festival, I'd receive this image from Donnie Lemke, one of my editors at Stone Arch Books. 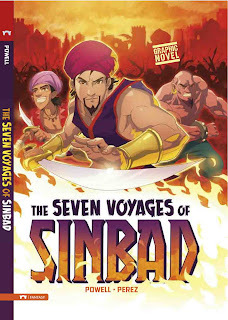 This morning he sent me this, the delightful cover of my new THE SEVEN VOYAGES OF SINBAD book by artist Daniel Perez, who also beautifully illustrated my The Hound of the Baskervilles and Alice in Wonderland. 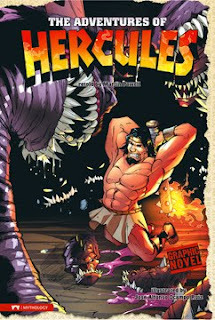 I loved writing this grand adventure story, and I enthusiastically dub Mr. Harryhausen as the book's official Muse. 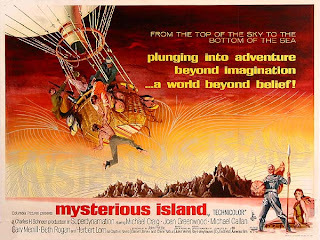 The Ray Harryhausen Film Festival continues with my all-time favorite of his many fabulous movies--MYSTERIOUS ISLAND. Showtimes are at 7pm and 9pm this evening at the Minneapolis Trylon Theater. Lisa and I will be there and we hope to see you, too! 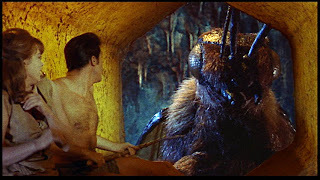 Currently, I'm rapidly finishing up commissioned stories for The Phantom, Ki-Gor the Jungle Lord, Black Angel, and a non-pulp related science fiction tale, as I partially clear my desk-load to begin writing the new adventures of THE SPIDER. I'm immensely nervous and very excited to begin. In the meantime, I thought perhaps some of you might be interested in seeing my box text for ReelArt Studio's sinisterly sensational statue of the Master of Men, written three years ago. It was an honor and a privilege being asked to provide this brief piece, and it has helped connect my name even closer with that of this fabulous favorite character. If you're a fan of THE SPIDER, or of genre sculpture in general, I highly recommend the statues of ReelArt Studios. The Spider, a.k.a. wealthy criminologist Richard Wentworth, is perhaps most popularly viewed by his frenzied multitude of followers as the most vicious hero from the Bloody Pulps of the 1930s and 40s. His justice was swift, merciless, and absolute. 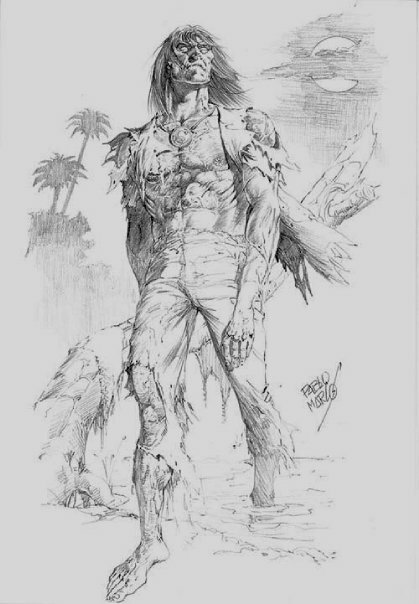 He was, in fact, far more terrible than any of the bizarre and murderous fiends that were fatally unfortunate enough to become entangled in his Web of Justice. 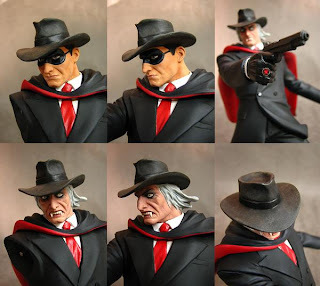 However, there was much more to the cackling, cape-swirling mystery man than mere wanton savagery. 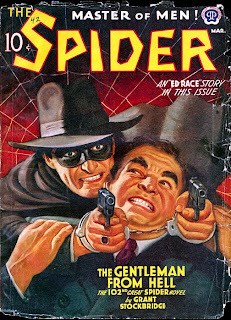 In September, 1933, Popular Publications first introduced The Spider—Master of Men—to the hungry eyes of the pulp-reading public and he soon took the newsstands by storm. The Spider’s monthly adventures reached mythic proportions as Wentworth’s New York City faced one impending catastrophic Doomsday after another, often suffering eerily familiar panic-inducing terrors that might well have been lifted from a 21st Century newspaper headline. The Spider boldly faced these monstrous madmen head-on with a venomous laugh and a thunderous brace of blasting automatics. 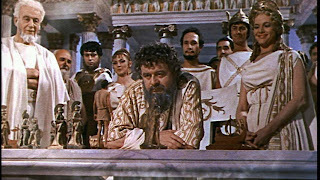 No villain, no matter how brilliantly diabolical, could ever hope to defeat the Master of Men. Under the breathless, white-hot searing prose of writer Norvell Page, the Spider’s most frequent chronicler, Richard Wentworth is the most fully realized and fascinating personality of all the classic crime fighters. 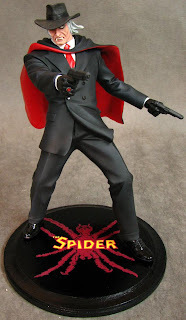 None of the other pulp heroes were nearly as three dimensional, angst-ridden, nor as tragically human as the Spider. 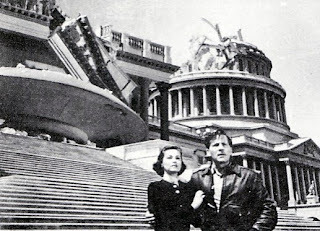 Wentworth’s passion and conviction were shared by his beloved Nita Van Sloan, who knew his darkest secrets, and often fought the apocalyptic menaces, ever threatening, bravely and brazenly, at the Spider’s side. 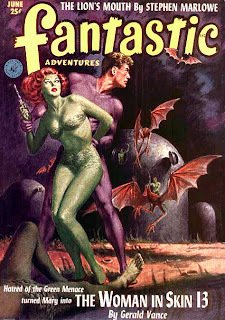 There was no other romantic relationship in the pulps quite like them. Today, over seventy years later, the Spider’s chaotic classic adventures continue to be savored by a fiercely loyal and ever-expanding fan base. Most recently Moonstone Books has considerably added to the mythos of the Master of Men by publishing THE SPIDER Chronicles, an anthology of brand new tales for the growing audience of crime pulp fiction. 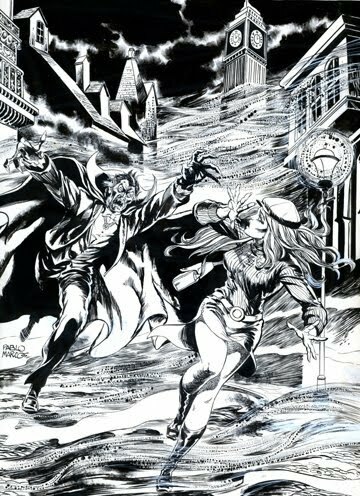 For me, as a writer, one of the biggest thrills of my career was being a part of this revival as one of the very few, very lucky authors who has experienced the rare fortune of adding to those original pulse-pounding 118 classic Spider novels. It was a dream come true. 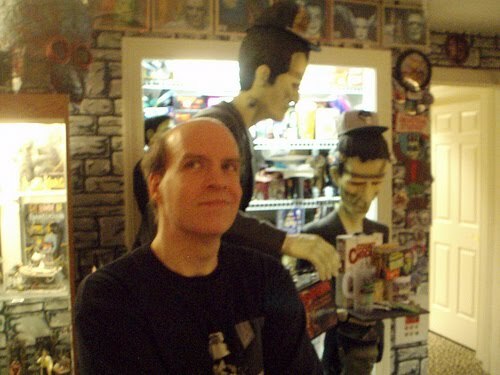 Now, most appropriately, Richard Wentworth’s awesome alter-ego has come to life in true glorious three dimensions in this magnificent unique statue by Reel Art, skillfully rendered by William Paquet, reigning master sculptor of the macabre. 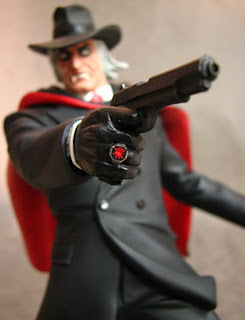 The Spider figure is wondrously detailed, from his twin .45s, steely evil-seeking eyes, and the famous arachnid-embossed signet ring. 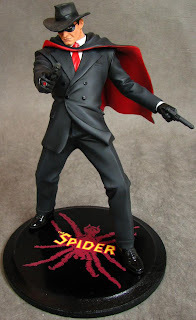 Further delighting Spider fans is the bonus addition of an alternate head. 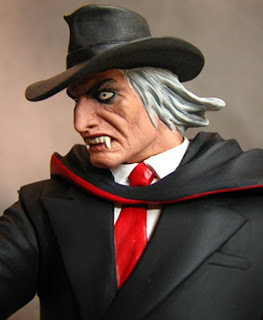 Along with the iconic masked version, as seen on most of the action-filled cover paintings from the original pulp magazines, the gruesomely fanged, fright-wigged, wild-eyed monster-hero from the chilling text itself is also generously included. Above the Law! 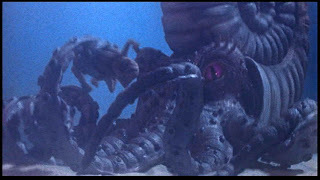 More deadly than the Underworld! Feared, hated, and wanted by both…Beware! Sad news. Charles Pierce, pioneering producer/director of The Legend of Boggy Creek, has left our dimension at age 71. This film was a favorite among the Drive-In Theater screens when I was a kid, with a startling and very effective television promotional campaign. 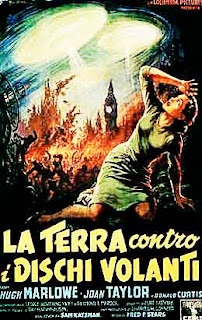 Commercials for the movie seemed to run several times an hour on our local stations in Louisville, each time showing a brief tension-filled scene that progressively became more frightening with each clip. 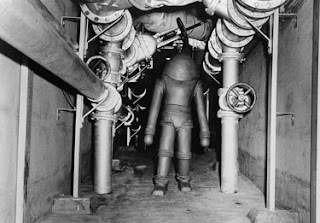 This thing looked creepy as hell. It was the movie's subtitle, "A True Story", that really grabbed all of us. Before long all the kids in my neighborhood, and my cousins living in rural Kentucky, were all talking about it. We had to see this movie! 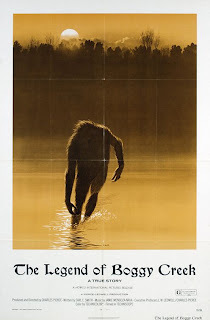 The Legend of Boggy Creek ultimately had quite an imaginative effect on me and I've never forgotten its simple, atmospheric power. So, I'm very grateful to you, Charles. You've been a very positive influence to my life. Rest easy, sir. You've earned it. 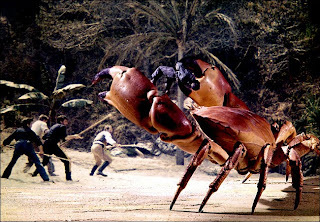 The Ray Harryhausen Film Festival continues with EARTH VS. 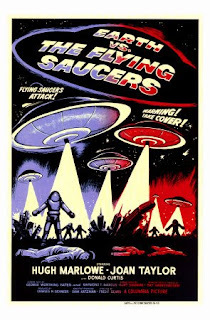 THE FLYING SAUCERS, this evening at the Trylon Theater in Minneapolis. Showtimes 5:30pm and 7pm. See you there! The Spider by Rafael DeSoto. 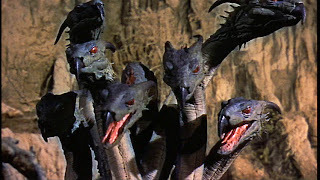 Ray Harryhausen Film Festival in Minneapolis! 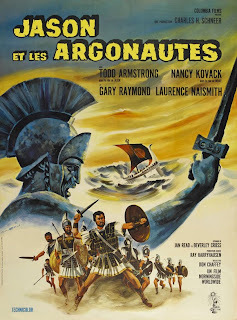 The Ray Harryhausen Film Festival begins tonight in Minneapolis, 7pm at the Trylon Theater, with JASON AND THE ARGONAUTS! 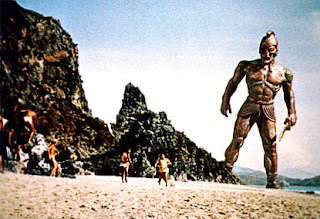 When I was a kid, the films of Ray Harryhausen held a special fascination for me. 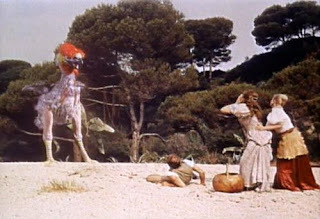 I was always prowling through the television schedule of our local newspapers, forever on the look-out for the next broadcast of 7th Voyage of Sinbad, The Mysterious Island, or One Million Years B.C. As was my ritual, in between seeing the movies, I wrote and drew my own comic book versions of the films to help keep me company. 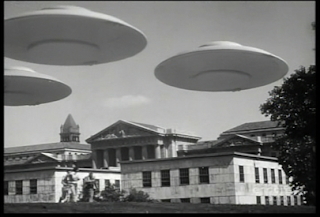 These films continue to hold the same magic for me today, and have remained among my personal favorites of all time. 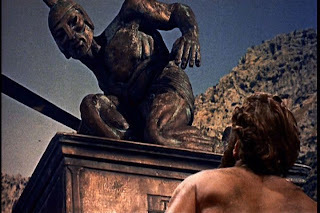 It was Mr. Harryhausen's miraculous touch that inspired my own The Adventures of Hercules children's book, published a couple years ago, as well as the upcoming Sinbad the Voyager, which I wrote just recently. 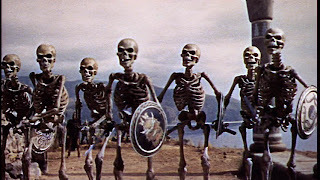 Without the slightest doubt, I know that Ray Harryhausen's classic productions will continue to fuel my imagination for many years to come. What would I have ever done without them? 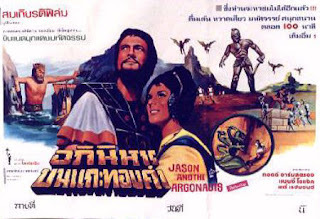 "Some say Casablanca, some say Citizen Kane...but for me, Jason and the Argonauts is the greatest movie ever made." Tonight's event is only the beginning. 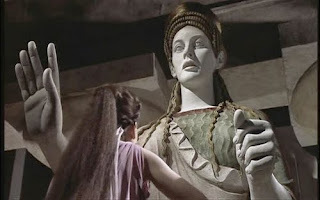 Six more Harryhausen epics will follow in the weekends ahead. Lisa and I will be there. Hope to see you, too!